Any fan of the great J.R.R. Tolkien knows that Hobbits are smaller-sized humans two to four feet tall. Here’s a hobbit horse from down under. Beloved FellowshipOfMinds member Tom in NC sent us this, to cheer and remind us the world is full of wonders. God bless you, Tom! Toy horses are usually pink and plastic – and aimed at young girls. 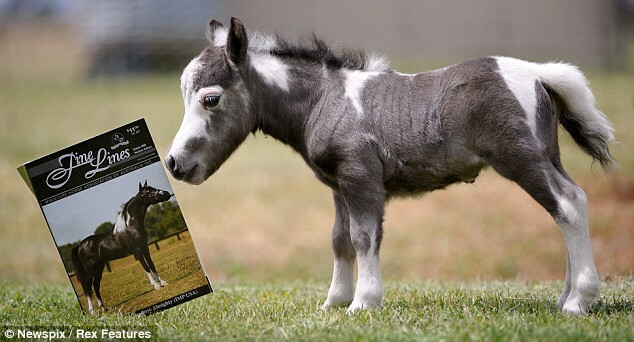 But this little pony is 100 per cent natural – and ready to make friends with anyone her size. Going for a walk: Sam leads the way, followed by Bliss and her tiny new daughter. Born ten days ago at a stud farm in the southern state of Victoria, Australia , the 15 – in miniature horse is yet to be named, but has already formed a bond with Sam Leith, 12. The horse, currently only a little taller than this book, is expected to grow to about 24 inches. ‘It’s amazing to see a horse so tiny. She’s about the size of a week-old lamb.’The horse is the smallest born at Riverdance and its arrival surprised even its breeder. The birth has generated such excitement in the community that local people are entering a competition to give the horse a name. Owner Lee Scown said she wanted a name that reflected the tiny, unique nature of the horse. ‘It’s the smallest horse I’ve ever had and she’s so gorgeous,’ Ms Scown said..
Not sure why but the pictures are not showing up Eowyn, let me know if I need to resend them to you. Or it may be just my computer, let me know. How precious!! I will never understand how atheists can believe that there is no God. Amazing pictures and story. Thanks, Tom!